← Are Nature’s accelerometers inside the otolith structures, the sacculus and utricule, acting as concussion sensors ? Just behind the juvenile herring’s large eye is the bony round shaped otolith structure. 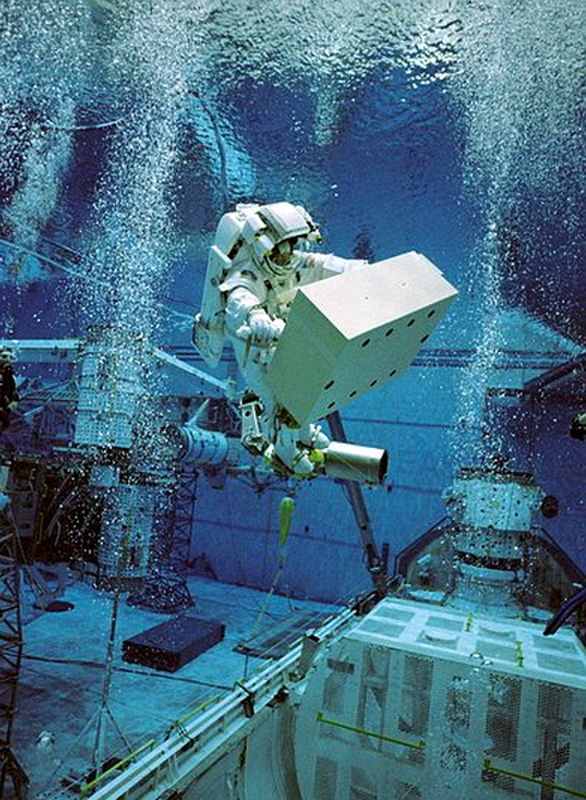 Cosmonauts prepare for space missions using the buoyancy of water as a simple scenario of reduced gravity to practice extra vehicular activity ( EVA) for space suit procedures outside their space craft. The little herring can be compared to a cosmonaut since both have something in common: a built-in navigation positioning sensing system. Each aquatic species positioning their bodies when moving around their water environment, knows intuitively where they are in 3-dimensional space. Both species, man and herring share specialized micro-accelerometers that sense the direction of gravity within their vestibular apparatus, even the one sixth gravity of sea water. Yet the herring’ s evolutionary heritage strongly pre-dates man’s vestibular system by over a few hundred million years. The little herring’s otolith is essentially frozen in time. Surprisingly, the vestibular system drives by pacing the autonomic system, not the other way around. Think of this very ancient herring’s otolith as the first priority within a hierarchy design of signalling language code. I look at our heritage from the vestibular system as a series of built upon senses that arrived in an ordered fashion, such that the vestibular code paces the autonomic system as it developed as first priority in evolution’s step by step progression. Just like how man has built the Internet during its inception during the ‘sixties, old computer code still runs at the core of current Internet messaging. Where do you see such subtle ancient priority presenting itself within Nature? 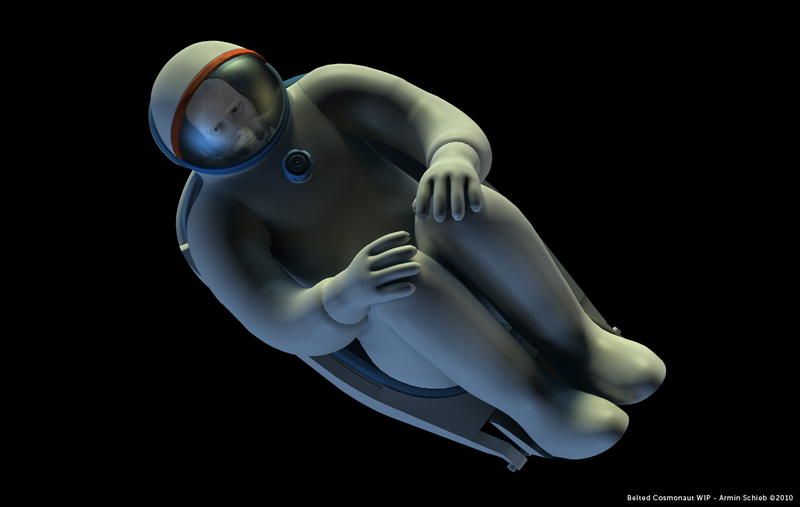 When a cosmonaut returns from a very long space flight in terms of microgravity exposure, the cosmonaut’s cardiovascular system is aberrant, acting out of sync to the return to the gravity vector on Earth of 1-G. All cosmonauts after space flight can not stand up, their changing of body position causes them to faint immediately. In the science language of the returned cosmonauts they suffer orthostatic intolerance. During the entire space flight the core signalling within vestibular networks without a one gravity vector acting into the cosmonauts vestibular system literally turns itself off. During their space-flight, all the micro accelerometers that make up the entire component chain into a functioning vestibular apparatus no longer sensed the One-G gravity vector. Sometimes this lack of gravity has completely incapacitated the cosmonauts space-flight into microgravity to the point all he can do is place his head against the Soyuz bulkhead unable to perform any of his assigned tasks, causing the space-flight to be aborted. What happens in microgravity to totally incapacitate a cosmonaut ? A glimpse of the importance of the vestibular system mapping into our brains can be seen from the report by Fred Previc, Jeremy Beer, Mario Liotti, Colin Blakemore and Peter Fox with their report in The Journal of Vestibular Research 10 (2000) 221-225 entitled Is “ambient vision’ distributed in the brain ? They describe the wide-field of view perspective of visual yaw motion on PET activation. The brain acts on preconscious visual inputs from the periphery that depend on the visual functions that are associated with the maintenance of spatial orientation. To solve the ongoing query: where am I? The human brain orients itself to the gravity vector. These authors comment with, ” These findings provide further evidence that the ambient vision signal is either processed or transmitted throughout the entire brain, as befits a visual function that is fundamental to all other perceptual systems.” In order to grab the magnitude of their observations I will make an analogy. The brain calculates using the entire resources available to it not limited to one specific zone but the entire communication connections throughout the entire brain in the context of mass information processing of the ambient vision input. We have been taught that discreet anatomical zones handle specific tasks within the brain’s anatomical locales. Now here is a process that uses the entire intranet of the brain to accomplish a task. Nature uses the hierarchy of signal processing to accomplish tasks. Sensing both gravity with visual input is at the top of the hierarchy for the reason that this task dominates the entire resources within the brain. It’s like a televised signal that is both listened to and viewed by every single person on Earth at the same time in simultaneous translation. The fundamental question is how do we see, what is our brain looking at outside of our perception that commands the entire brain to process the visual scene? Is such a brain demand possible to dominate the entire brain network of connections, monopolizing all its resources ? The incredible answer appears to be yes. As we point our bodies in 3-D space our peripheral vision captures out at the periphery of our visual field specific references retrieving all those edge shapes . Giving back the orientation of the Earth’s horizon telling us where we are in the horizontal plane. In microgravity those edge clues felt automatically, are sensed in our otoliths. But there is no down sense. 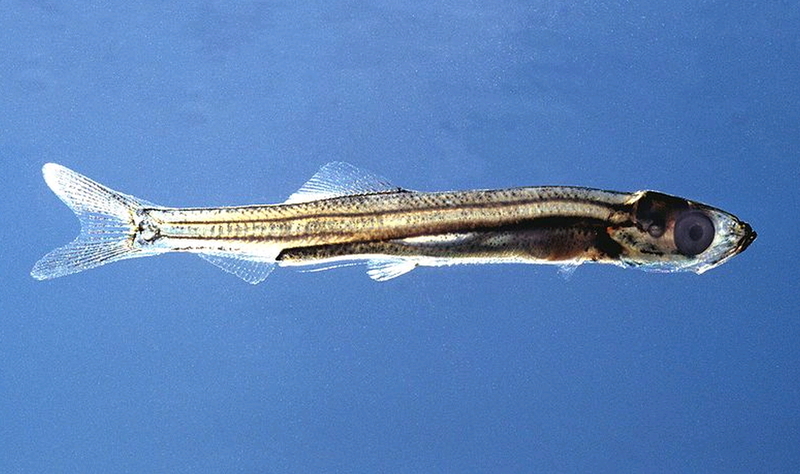 Unlike the little fish knowing its horizontal orientation position along its body confuses the integration of the gravity accelerometers sensing to dissociate the entire brain network. We become lost without those peripheral orienting edges feeding back to us. “Astronauts who have spent prolonged periods in the zero gravity of space tend to show eye abnormalities linked to pressure around the brain, another study has confirmed. The new study, which involved magnetic resonance imaging of the eyes and brains of 27 astronauts – a larger sample than previous studies — also found abnormalities in the pituitary gland and its connection to the brain in three cases. The gland, found at the base of the brain, secretes and stores a number of important hormones that regulate growth, metabolism and reproduction. The findings, published online in the journal Radiology on Tuesday, may point to a “hypothetical risk factor and potential limitation to long-duration space travel,” said study co-author Dr. Larry Kramer, a professor of diagnostic and interventional imaging at the University of Texas Medical School at Houston, in a statement. That means they could pose a problem on future missions to places such as Mars. Lieutenant Colonel Oleg Valeriyevich Kotov, has flown two long duration spaceflight on the International Space Station logging just short of a year in space. Kotov is currently assigned to the Soyuz TMA-10M/Expedition 37/Expedition 38 long duration spaceflight scheduled for 2013-2014. Astronauts have complained for decades about vision problems such as blurriness following trips into space. A recent NASA survey of 300 astronauts found correctable near and distance vision problems in 48 per cent of astronauts who had been on extended missions and 23 per cent of those who had been on brief missions. In some cases, they lasted for years after the astronauts returned to Earth. In the new study, the astronauts had spent an average of 108 days in space. Their eye abnormalities were similar to those seen in patients on Earth with idiopathic intracranial hypertension. Patients with the condition have increased pressure around their brains for no apparent reason. 33 per cent had expansion of the space filled with cerebral spinal fluid that surrounds the optic nerve, which connects the eye to the brain. 22 per cent had flattening of the rear of the eyeball. 15 per cent had bulging of the optic nerve. 11 per cent had changes in the pituitary gland and its connection to the brain. An earlier NASA-sponsored study of seven astronauts, published last November in the journal Ophthalmology, found similar abnormalities and also noted that they were similar to those experienced by patients on Earth suffering from pressure in the head. But it noted that astronauts did not experience symptoms usually associated with that problem on Earth, such as chronic headache, double vision or ringing in the ears. What links within the brain circuits the eyes, the cardiovascular system, to the bone system and the pituitary gland ? What network can influence such a diverse grouping of effects ? The link is the positional sense of gravity felt as a register of direction into all cells. 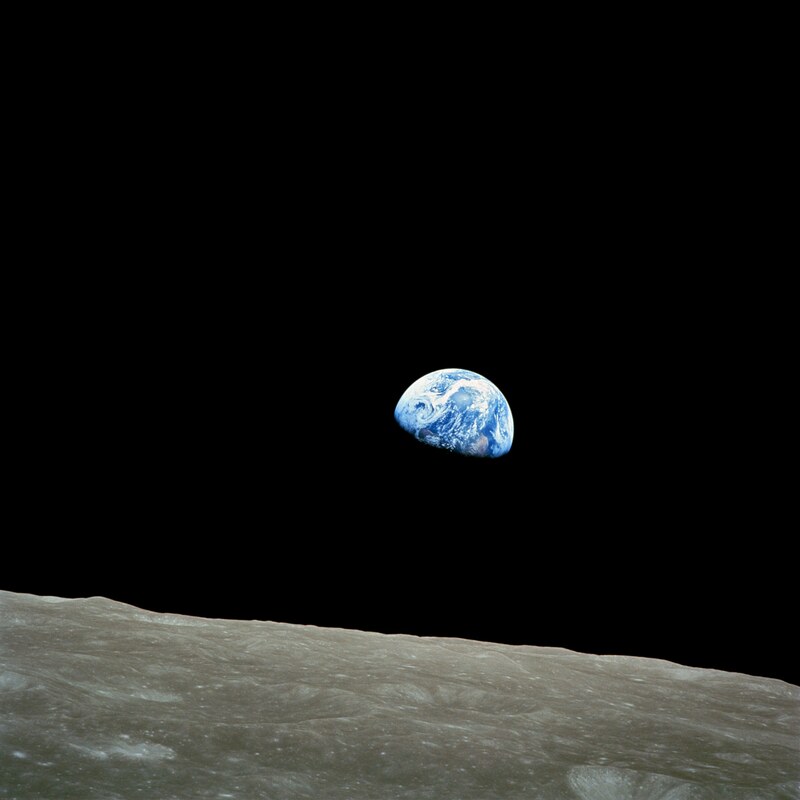 Let’s pull back from that last statement, let’s pull back to the view of Earth from the Moon. Until we experienced the view of our own planet from space our limited context could not begin to take the concept of Gaia, of how perhaps our plant was a symbiotic life form on its own. 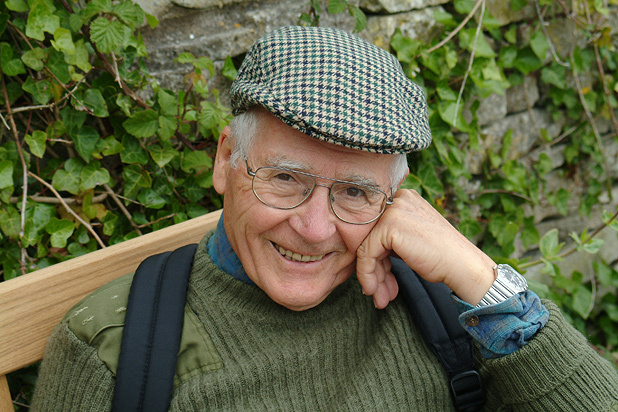 The concept of Gaia was introduced by James Lovelock, a planetary biologist working at the Jet propulsion Laboratory in California. Lovelock was posing the question to if we are to study other planets, can we make any assessment for the detection of life on these other planets by measuring something of significance ? What do we look for on the planet view of scale ? What can link everything? Is there something common with all scales of life. Does evolution give us this answer ? Is it possible that gravity is that unifying link between everything biological? Let’s dwell on that particular observation. What is the evidence a sceptic might ask ? The response from the perspective of seeing our planet from space is to begin seeing our own cooperative inner metabolism as if it were an entire planet. We have to start seeing our entire body as an expression to the omnipresence of gravity. The picture of the tumbling cosmonaut is symbolic of our rupture from the perspective of seeing the cosmonaut from a larger scale both of time plus distance. 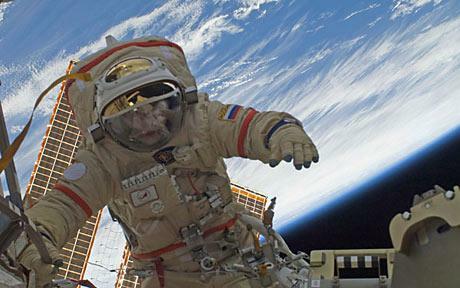 The tumbling image is appropriate since the cosmonaut is outside of the Earth’s gravitational effects. But his entire metabolism communication is ruptured, his gravity vector has reduced into 1% of its mega influence. Therefore his metabolism output will adjust as it needs toward the new significantly reduced gravity vector. To deny this effect is simply an arrogance of a magnitude that defines the human ego. Everything revolves around us is our usual perspective. Yet within the context of larger timescales, like our own galaxy diameter, in terms of light years between other galaxies our self view shrinks into nothingness. The perspective of micro-gravity as just an anomaly in our own humble attempts at space travel is grossly flawed. We must bring gravity with us, gravity is the life of our life shape interactions. 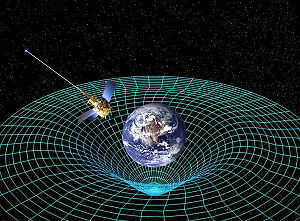 We must create our own gravity field, the easiest way by rotation of the crew cabins. Otherwise, we will have to deal with a general system failure, reported as ‘space eyes’, bone loss, cardiac intolerance, pituitary hormone deficiencies plus a host of other metabolic changes we are not even aware of, let alone have measured. Gravity is our human regulator, gravity is our own personal Gaia that regulates the whole metabolic system within each of us. What is the evidence that gravity is on the driving force for evolution? I will cite from Protoplasm (2006) 229: 143-148 by authors D. Volkmann and F. Baluska Gravity: One of the driving forces for evolution. Life on Earth in its present diversity and complexity has developed under constantly changing conditions.The gravitational force, however, is one of the most constant factors guiding and affecting the evolution of all organisms.” In Earth’s panorama of changes, major pivoting points have transformed life’s choices all along the way. These transitions are spread over time yet each point of transfer can be reflected upon. One such mega transition is going from a mainly nitrogen atmosphere into a partially oxygen atmosphere. The transition from a dry planet into a wet planet with oceans of water occurred over geological time scales. Yet down under the super compressive depths of the earth’s crust thermal events afforded more opportunities for biochemical interactions to bring about the conditions of early life forms to thrive, learning the critical steps for survival from one generation into another. Life took its first steps onto land to introduce land based physiology after its early water based segment had run its pace. Behind all of these major transition deflections the essence of cellular architecture plays out in the actual assembly rules that determine the basic building blocks of construction. Different problems of adaptation can be formed depending on the nature of environmental surroundings provided by water versus land for producing organismal diversity, with mutations then selection pressures responding to the dynamic changes. In micro-gravity there is no force of mechanical load as gravity is no longer the vector down pointing, orienting the force, now the orientation is everywhere. Mineral depositing now has no place to load the elastic concrete in terms of position of need. The counter-balance of bone metabolism, remodeling behaviour takes over. Force sensed stress needs are no longer addressed as the bones get progressively weaker in terms of handling the non-existent strain. Right: The Needle Tower – a 1969 tensegrity sculpture by artist Kenneth Snelson – viewed from below.Sculptor Kenneth Snelson’s “Needle Tower” is a fragile-looking thing. Criss-crossing rods suspended by taut wires soar perilously upward 20 meters high. Surely it ought to crumble or fall over. Yet it doesn’t. When the wind blows, the Needle Tower bends, not breaks. When someone shoves it, it shoves back. The tower is lightweight, strong and curiously beautiful. Just like the skeleton of cells. Like Snelson’s (floating tension) sculptures, cytoskeletons have tensegrity – short for tensional integrity. They balance compression with tension, and yield to forces without breaking. In the Needle Tower, the wires carry tension and the rods bear compression. In a cytoskeleton, protein chains – some thin, some thick and some hollow – take the place of wires and rods. Linked together they form a stable, but flexible, structure. Left: Cytoskeletons of human endothelial cells glow green in this immunofluorescent micrograph. The filaments meet in triangular structures resembling a geodesic dome – an example of tensegrity. “The cytoskeleton perceives gravity – or any force – through special proteins known as integrins, which poke through the cell’s surface membrane,” explains Ingber. Inside the cell, they’re hooked to the cytoskeleton. Outside, they latch onto a framework known as the extracellular matrix – a fibrous scaffolding to which cells are anchored in our bodies. “The beads turned and tried to align with the field, just like a compass needle would want to align with the earth’s magnetic field,” explains Ingber. The beads twisted the integrins and, in turn, tweaked the cytoskeleton. As more stress was applied, the cytoskeleton became stiffer and stiffer. In fact, it become so stiff that the beads couldn’t be turned much past a few degrees! Tugging on integrins not only caused the cytoskeleton to stiffen, it also activated certain genes. “Activating a gene” means coaxing a gene to generate RNA and proteins. That’s important because proteins are little messages that signal the cell to take action. Tickling the cytoskeleton, it seems, can make cells switch between different genetic programs. Even before the magnetic bead experiment, Ingber’s group at Harvard had already discovered a link between cell geometry and cell behavior. In one experiment they forced living cells to take on different shapes – spherical or flattened, square or round – by placing them on tiny adhesive islands of extracellular matrix. Cells that were flat and stretched tended to divide. Cells that were round and cramped tended to die. Above: Cytoskeletons give red blood cells their characteristic flat shape. The transition from water species into land species accounts for a 1000 fold increase in the abundance and diversity of land creatures versus water organisms. Despite the perception of water life to a constant gravitational force in the range of 1/1000 g in spite of Earth’s acceleration of 1 g acting constantly since the Earth formed, the density difference between water and air could be the reason for the one thousand fold difference. In the picture of the floating paper clip are some of the elements hopefully addressed in this essay on gravity. The weight of the paper clip is dispersed across the surface of the water. The water has deflected enough to allow the paper clip to float. 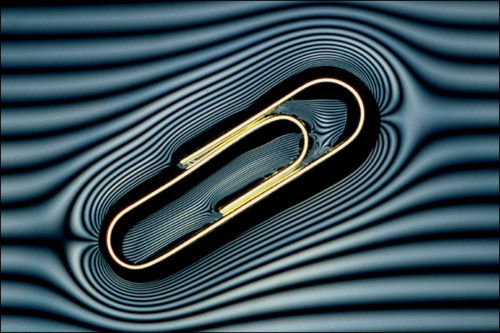 The tension lines surrounding the paper clip are deformed as if in a gravity field that behaves in a somewhat analogous fashion of attraction deforming space-time surrounding a sizeable mass interacting with a smaller mass. The patterns are not evenly spaced around the static outline of the paper clip, they get closer as the tension net increasing especially inside the paper clip. The water has a flow appearance as if it is moving. Of course the water is moving at the level of molecular vibration but we can’t see visually down to that scale in this picture. Floating tension is the attachment within a gravity field of force that can suspend the mass of an object between the compression forces within the water attracting molecules themselves. The paper clip is wet if you were to lift it out of the vessel so there is a deep attraction layer at the interface between the paper clip metal with the water surface. Within this tension water net the paper clip floats but the paper clip is definitely attached along its length into the water. The entire process works because both the water and the paper clip are in an oriented space that permits this kind of deformation of a tension surface. That oriented space is what we loosely invoke describing a gravity field. The astronaut tales reveal to us the mega significance of gravity at the molecular interface. We are always at this surface of a gravity field influencing all intimate cellular interactions within a time line of evolutionary heritage combining to shape cellular behaviour. There is a mass information effect performing at the speed of Nature’s pace transferring in both directions across all plasma membranes. These same cells are linked into both local with immediate neighbourhoods then into larger boroughs blending into cities of cells within countries of cells. All listening all responding all reacting at lighting speed at the blur of shape changes happening. To begin to understand our real physiology, we must first understand the importance of gravity sensing throughout the entire spectrum within our entire cellular networks. We have to see ourselves as we can be seen from space in a gravity reduced version to begin to understand how gravity itself has shaped our biological evolution. The final words for this essay were translated from Rossiiski Fiziolgichesii Zhurnal imeni I. M. Sechenova, Vol 89, No 3, pp 280-291, March, 2003 in Neuroscience and Behavioral Physiology; Vol 34, No 8, 2004 The Role of Gravitational-Dependant Systems in Visual Tracking by L. N. Kornilova. Their quoted abstract outlines the dynamic changes that cosmonauts, like Oleg Kotov contribute to a fundamental shift in our appreciation of the hierarchy of control that gravity has created in our sensory perception of the universe around each and everyone of the Earth’s people. Gravity sensing is at the core of our own intranet of signalling, starting at the vestibular sensing, be it the eyes, the beating of the heart or the strength of our bones, the entire system behaves in a Gaia fashion in complete integration within a floating tension cellular framework, a system that is always ‘on’ during our life span.